The official opening of the new Basingstoke Fire Station on 15 February marked a new chapter in the Hampshire Fire and Rescue Service history. Current crews from Hampshire Fire and Rescue Service and well known faces from the past, who between them have centuries of firefighting experience, joined dignitaries to mark the opening of the new Basingstoke Fire Station. Hampshire Fire and Rescue Authority Chairman Cllr Chris Carter introduced speeches from Chief Fire Officer Neil Odin and Lord-Lieutenant of Hampshire Nigel Atkinson. Visitors were treated to a showcase of the town’s fire heritage as well as a tour of the ultra-modern £6-million station which is one of the most strategically important in the county. Based on its original West Ham Close site, the bespoke station has increased vehicle capacity and improved access enabling it to respond to incidents as quickly as possible. It also has enhanced training facilities. CFO Odin said, “This is a modern station for a modern era. “It will be of benefit to the people of Basingstoke and the county as a whole and help the fire service carry out its job of keeping the communities of Hampshire safe. The opening of this station was particularly special to Station Manager Jones as he has lived in the town for 25 years since joining Hampshire Fire and Rescue Service. He has served the town as a firefighter, a crew manager (then leading firefighter), rider station officer and watch manager before holding his current post. Cllr Carter said: “This prestigious event marks the dawn of a new age of firefighting – and a new era for the service. 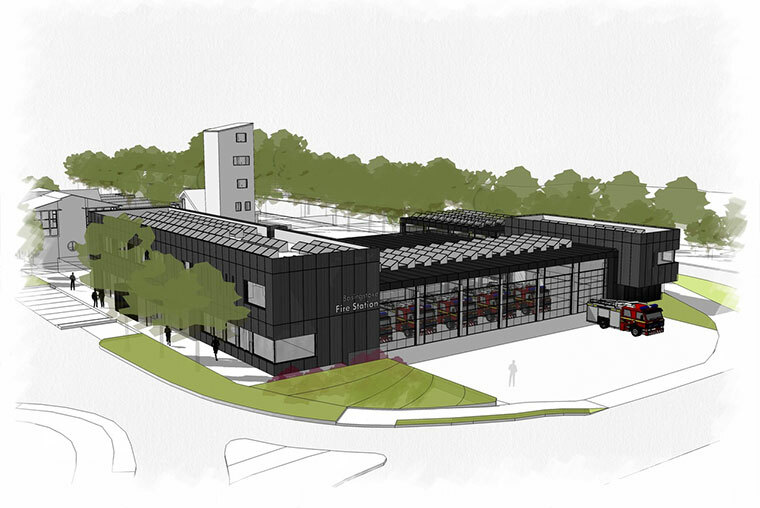 “The bespoke training facilities and focus on community engagement shows that Hampshire is at the forefront of modern firefighting. The station has 64 full-time firefighters, 18 on-call firefighters and four members of the Community Safety team. It also has three fire engines, an aerial ladder platform, a response support vehicle, a command vehicle and a small fires vehicle. There are plans to allow community groups to use the station in the near future. Kier Construction Southern started work on the new building in May 2016 while the crews were based in temporary on-site accommodation. The last station to be built by the service was Winchester seven years ago.